An intense and focused Bordeaux styled Meritage with a heritage going back to the original 1988 vintage. Aromas of currants, berries, plum, and spices abound. Rich and full on the well textured palate that shows balance, power and elegance. Overall it unfolds throughout to a long satisfying finish. Each lot was punched cap fermented and finished in barrel where it was aged for 34 months unracked. Then the blend was made into tank and left to evolve for two months then bottled unfined. Twenty-one years after making its debut, every award winning previous Vintage a signature wine of Mitch Cosentino made at Cosentino Winery. 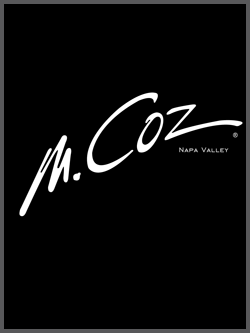 This is the 2009 M.Coz and the first from Mitch Cosentino's pureCru Napa Valley Winery. It continues the tradition of only being bottled in extremely limited quantities when it is equal or superior to the greatest wines in the world made with Bordeaux red grape varietals. Prior to release, this wine has already won a major wine competition, Gold Medal, Best of Class award, as has virtually every previous vintage.